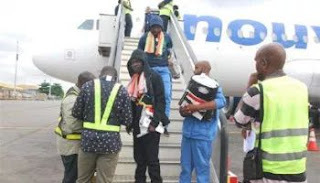 Some 420 Nigerians will arrive in the Murtala Muhammed International Airport, Lagos on Tuesday via two chartered flights while another 160 would come back on Thursday. The return fights are often supervised by the International Organization for Migration and they are done for the trapped migrants who willingly choose to go back to their home countries. Many groups of migrants have returned to their countries over the last year via the IOM programs, mostly from Nigeria, Niger and Somalia as well as Chad.